2014. As of this moment, there’s only a separation of two calendar weeks – but it somehow it already seems a lifetime a go. I’ve heard it’s just one of those things about aging, and understandably so: the older you get, the years become a smaller and smaller percentage of your life. 5 year old Amanda got to enjoy the year as a fifth, or 20% of her life – and here I am, inches away from 30 and last year merely accounts for 3.3% of my time on this wonderful planet. But in that year, twelve months, 365 days, 525600 minutes – I started a miniature business, delved into my DIY capabilities, moved in with the only man I ever want to live with. Hand in hand, we’ve made friends across the West Coast while simultaneously passionate pursuit of perfecting our crafts while diving headfirst into the electronic music scene. I’ve been humbled to work alongside some of the best and brightest minds in the industry, and am living out a my adulthood’s childhood fantasy. After seven years of living in Los Angeles, I was finally booked for a paid modeling shot; my lost dream and the reason I swapped zipcodes as a young college grad. From Lighting in a Bottle to Global Dance, Shambhala to HARD Day of the Dead – I consider myself blessed to be taken in by so many different music communities and families; and then to be entrusted by the music community to share that journey, and evolve what it means to be part of it – it’s more than I could’ve ever asked for. But, that’s not to say my year didn’t have it’s equivalent share of setbacks – after being in a car accident last Spring, I was anxious behind the wheel for months, I resigned my maid of honor status by endeding what I thought was a close friendship and I’ve been living with an obnoxious Bartholin cyst since the Summer. Whether your year was full of accomplishments and accolades or trials and tribulations, New Years Eve marks a time when the lot of us can put on our party pants, forget our worries and party like it’s 1999 (or, 2015, whatever). As the penultimate day of 2014 quickly approached, I was haphazardly balancing work, family and trying to pack for that my favorite blustery city in the Bay, San Francisco. For the second year running, Danny and I were off, off and away – to the land of tech talk and Burner babble, where the Sports teams are hot and the weather is brisk, the skyscrapers tower above you while the city rumbles with animation. Now in it’s 15th year running, Sea of Dreams was plotting a triumphant return to the Bill Graham Civic Auditorium after last year’s immense success. In an incredibly welcomed yet unprecedented move – they booked a two night stand for the event. 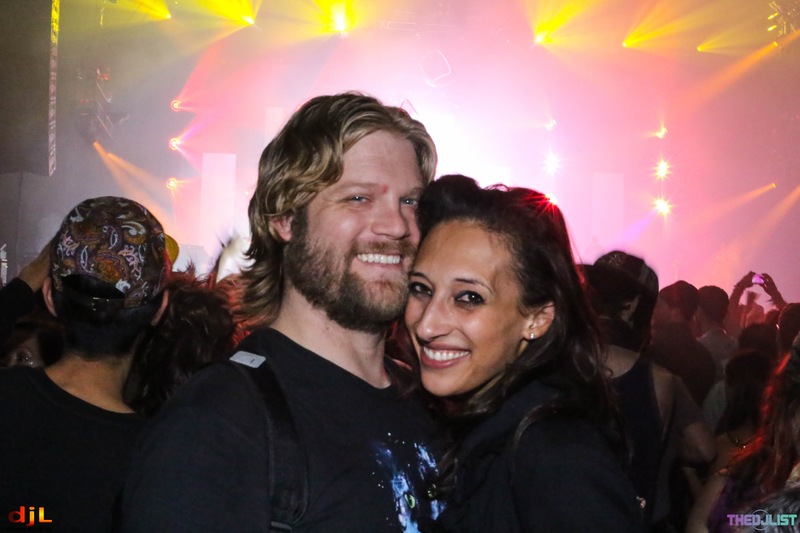 The brainchild of Joegh Bullock, founder of Anon Events, Sea of Dreams was celebrating a decade and a half of decadence, dancing and deliriously wonderful vibes in San Francisco with support and assistance from Another Planet Entertainment and Sunset SF. We crushed the 5 on Tuesday morning, leaving as early as possible so we could muster in a nap before the first night of the show. It’d been forever since I’d had a healthy dose of Pretty Lights, and now – I’d be seeing him twice in two nights. Christmas might’ve come early for some, but it came late for me and I was in no way complaining. The first night of Sea of Dreams was as laid back as we were feeling, with only one active stage an intimate crowd and only a handful of artists, but they were all bursting at the seams with talent. For this night only, dancers, festies and music lovers of all kind brought out the flow toys and hoops as they grooved to the salacious sounds of Sea of Dreams. The early bird caught the worm at 7pm when Pumpkin jumped on the decks, but for anyone that missed his opening set – he was featured in between the other sets for an equal amount of time, if not longer, than his actual set. My only wish was that he was a little more highlighted as the crowd got down to a slew of remixes, from the tried and true MJ vocals to his soul tingling remix of Wildlight’s Twirl Me. For anyone who’s said that true music is dead or lost within EDM had surely never witnessed the musical genius of the rest of the lineup. Next to grace the stage were Adam Deitch and Borahm Lee, better known to fans as NYC glitch-hop duo Break Science. From start to finish, they expertly fused genres from Funk to Hip Hop and Breakbeats with layered, live elements. Break Science ebbed into Pumpkin and then flowed into The Glitch Mob. Living in LA since ’08, I consider myself more or less a local down south at this point – so seeing the Glitch Mobbers up in San Francisco was a nice treat. They kicked the crowd’s energy up, flowing through tracks from Love Death Immortality and older, crowd favorites; a solid set from the Mob, but being a pre-NYE event, I was hoping it would have been more raucous than it was. But that was immediately forgotten as the stage was stripped and the equipment rearranged. Left and right, audiophiles were geeking out as the acoustic musical setup took place and made way for the last performance of the night: the man, the myth, and the lights – Pretty Lights, to be exact. For this two night stand, Derek Smith brought the beats – and a full band, equipped with keyboardists Bor, trombonists, trumpeters, a Hammond Organ, a mixer and a drummer. And quickly, you remember why it’s called the ‘Pretty Lights Family’ – it features Scott Flynn of John Brown’s Body, Lettuce’s Eric Bloom and both members of Break Science. – at the very least. And we can’t forget, Lightning Director Greg Ellis, but you might know him better as LazerShark – and does that guy ever live up to his name! For the next two hours, hundreds of eager ears danced their cares away until New Years Eve Day on a musical high that you can honestly only get from real instruments. There’s something in their tonality, the depth, the layering, the colors of the notes and harmonies they create. 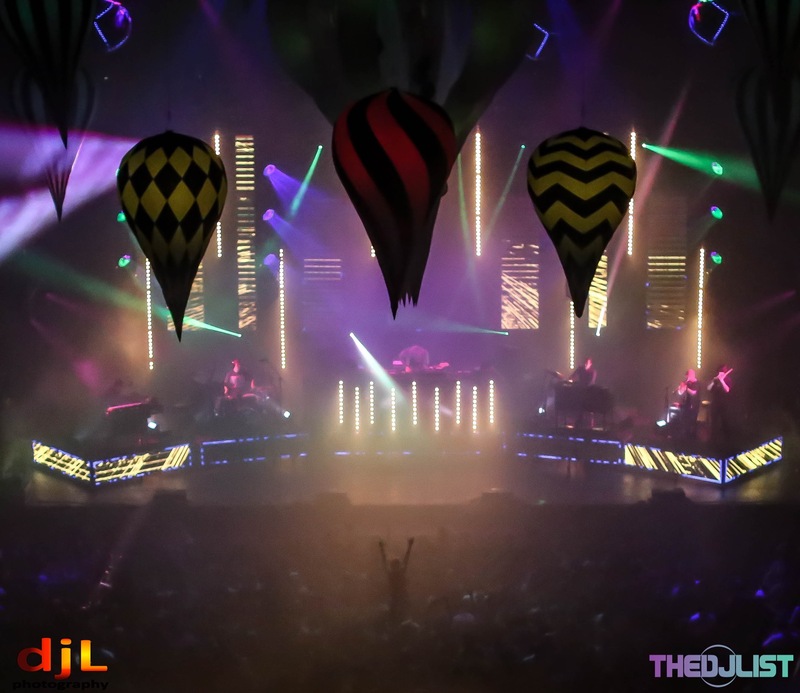 Nowadays within EDM, were so accustomed to a one man show – but we forget that traditionally, culturally, historically – music has been a multifaceted, artistic vehicle that encompasses the community and brings it together, in celebration; and Pretty Lights did just that. After the show, we forgot about the blustering wind and frigid weather while reminiscing on the beauty and wonder of the PL Live Band; a perfect pre-party for the main event. Overnight, the wind subsided and the New Years Eve excitement was palpable as the sun rays broke through the window. Puffy white clouds dotted a surprisingly bright blue sky as the last moments of 2014 dissolved in front of us. During the day, we gallivanted around Crissy Field and over the Golden Gate Bridge – dishing on our favorite moments on the night and eager to feast on the main course of music. The sun slipped into the Pacific Ocean while spirits soared simultaneously from each corner of the city. Strolling up to the second night of Sea of Dreams, the mood was elevated and enlightened, overflowing with ostentatious costumes and enigmatic personalities. Tonight was the big night; hello, 2015! If the main room was the main course, the small rooms may as well have been decadent appetizers that could fill you to the brim. Off to the right side of Bill Graham, the aptly named Trapeze Room was in full swing – fully equipped with life burlesque performances from local favorites Meka La Crème, Elektra Cute, Olivia Bellafontaine, Mojo Deville, Hunny Bunnah, Iza L Vamp, Tonya Kay Jay Siren and Miss Emma Nation. Throughout the night, DJs from The Gentlemen Callers of LA, Jazzy Fox, The Bellhop, Delachux and The Klown delighted party go-ers with the delectable rhythms of Electro Swing until the late hours of the morning. 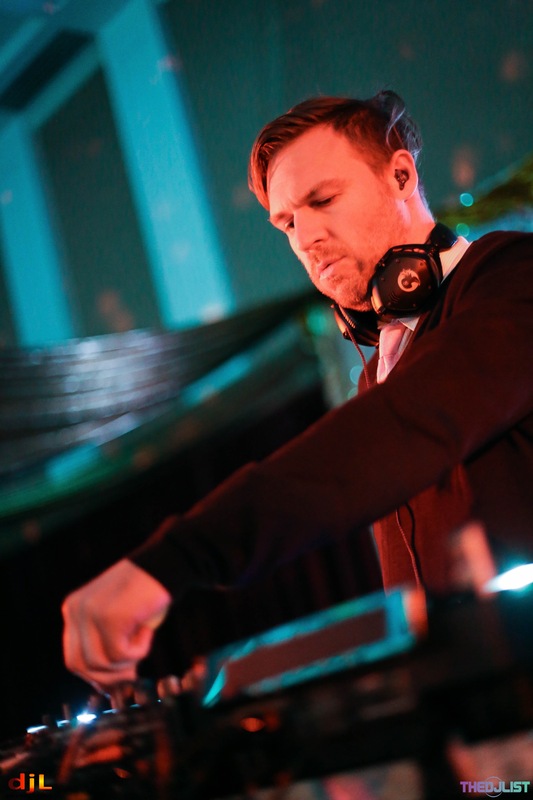 If you took a few steps back, the Silent Disco was getting a quiet groove on with the likes of Matt Haze, Analog Disco, DJ Phleck and DJ Mancub – just to name a few. On the flip side, there were some Funky Deep House and Disco vibes being tossed around jubilantly in Larkin Hall. An eclectic array of artists – from Dirtybird’s Worthy and the Fort Knox Five to Sea of Dreams’ own Robbie Kowal as Motion Potion – delivered exceptional sets to eager fans, lapping up celebratory drinks and reveling in style on the dancefloor. Descending onto the main dance floor was a treat in itself; decorations adorned the ceiling while live painters and artists from Anthony West to Gregorio de Masi lined the walls, finishing the musically influenced masterpieces they began the night before. Mikey Thunder opened the night, followed by the funky freshness of Lettuce. Beats Antique came out swinging with animated set, more exuberant than their Creature Carnival Tour. Live performers including Zoe Jakes writhed to a bass heavy take on world music, with group members David Satori on the violin and Tommy “Sidecar” Cappel on the drums. 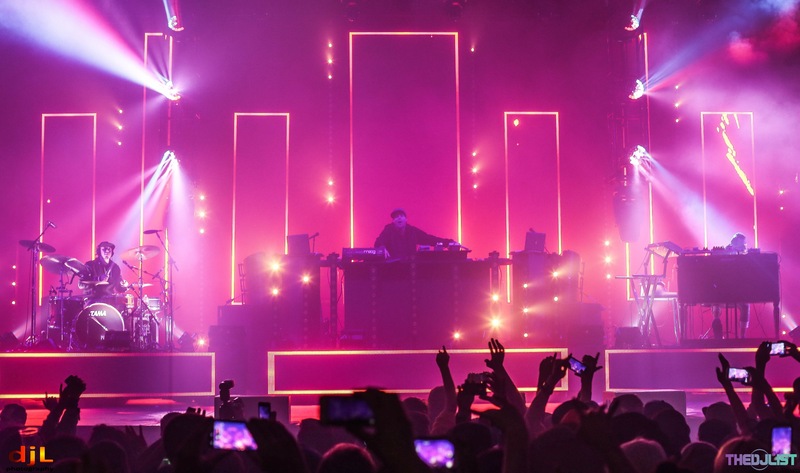 For the second time in as many nights, the Pretty Lights Music Band reminded the crowd what dance music should truly be about – musicians and artists collaborating on the creative process, the end result – pure magic. Lightning Director LazerShark outdid himself, as the room filled was once again bombarded with the salacious sounds of a menagerie real instruments. I can’t stress how wonderful it is to hear the color a brass section produces or the emotions an organ can convey. As Derek and the band flowed through old (and personal) favorites like Hot Like Sauce and Keep Em Bouncing, I actually forgot that we’d just seen him the night before; it was a completely different vibe, but the same musical prowess and passion. Whether it was the exceptional talent presented by the Pretty Lights Full Band, a desire to head home after the midnight ball drop or the almost poetic lull of music after Pretty Lights as the stage was discombobulated and reconfigured in front of our eyes – the crowd seemingly disappeared at 1:30; only to be slowly drawn back to the dance floor as Flying Lotus took the stage. The 2am crowd at Sea of Dreams had a mystique to them, a twinkle in their eye and an extra bounce in their step. As the music picked up, a hushed tone settled over the room; bodies at rest were revived and reinvigorated by the subtle tonality of near binural beats layered over intelligent lyrics. Dancing suddenly felt more like reacting as the low end frequencies emanated from my head down to my toes. 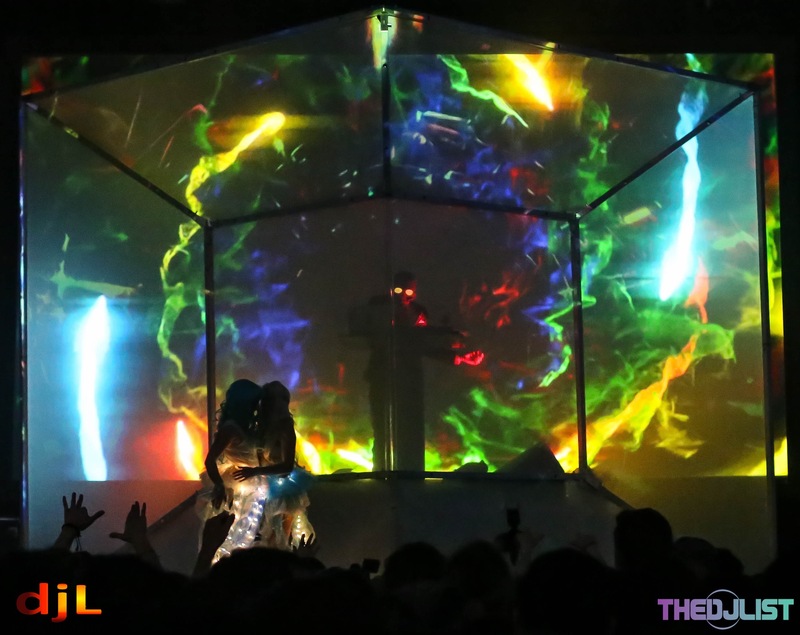 We stood there, eyes transfixed on the cube come to form in the center, projection mapping psychedelically warping our minds. The lyrics wrapped their way around our skulls and into our memory, while the projection mapped visuals manifested, fractled and spiraled into and out of control. Tl; dr: my mind was blown. Like a select other festivals that boast permaculture and collaboration through societal progress – Sea of Dreams is about more than just the music; it’s about the culmination of a music and collaborative community that embrace it. I spent the two nights of SOD celebrating with good friends old and new, festival friends that I’d made at Lightning in a Bottle and new friends just as thrilled as we were to rock into the New Year surrounded by exceptional artists, visionaries and peers. With the menagerie of live musicians that graced the main stage we’re seeing true musicians push back against the stigma – displaying their instrumental prowess as well as their exceptional production skills on the same scale. 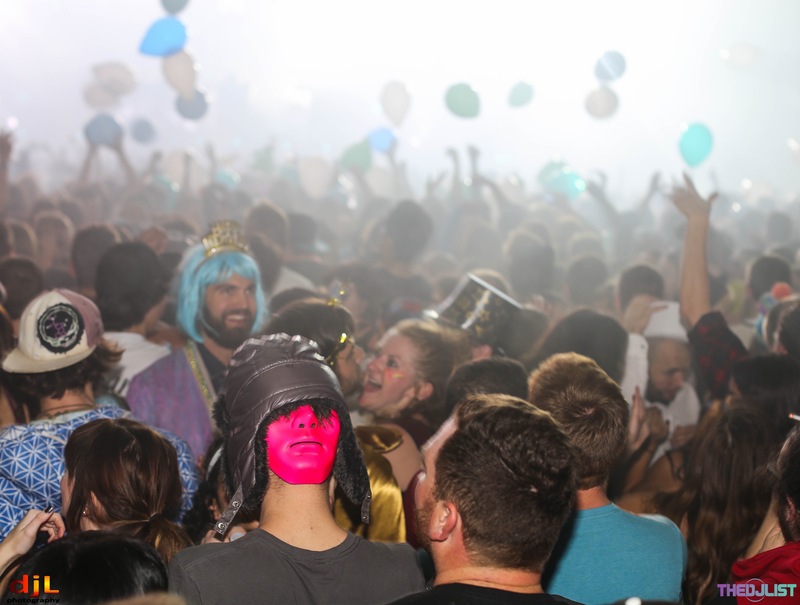 it’s a different crowd, a different edge of the venn diagram that EDM lovers mingle between. For once, the ‘Dance’ was rightfully thrown back into the moniker ‘Electronic Dance Music’ and was sweet music to all of our ears. It’s been said that how you spend your New Years Eve is indicative of how your year is going to be, and if so – the dance community is in for quite a treat this year. To take a gander at the breadth of the photos from Sea of Dreams, head over to The DJ List’s Photo Gallery or our photographer Daniel Leist’s Gallery.